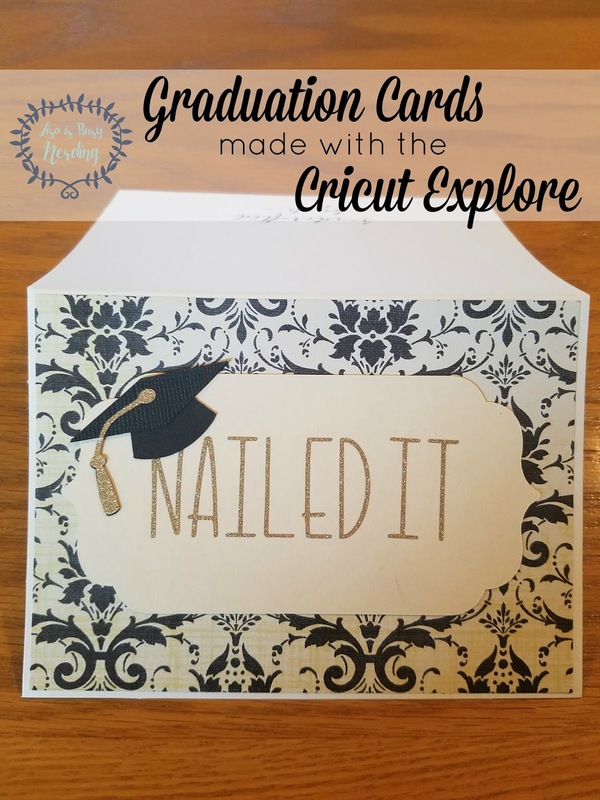 The first thing I did when creating these cards was search the Cricut Design Space landing page to see what ideas were out there for graduation cards. After finding the perfect one, I checked to make sure that all the elements were available with Cricut Access. 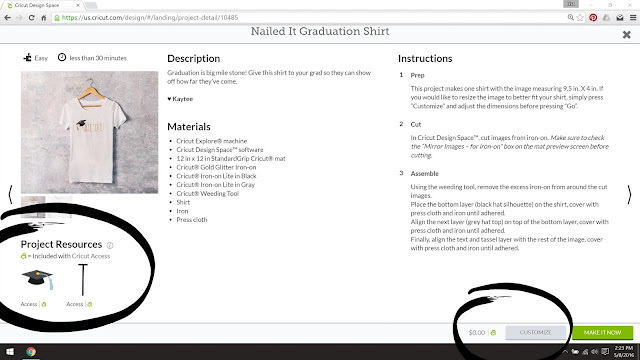 The graduation cap and font are included with Cricut Access - WIN! Now, since I didn't want it to be a t-shirt, I needed to customize it for a card. 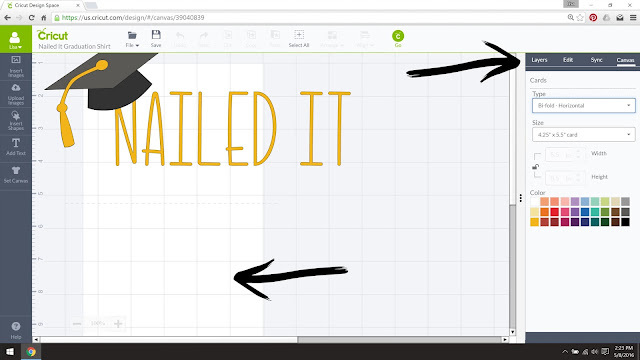 So instead of hitting "make it now" - I hit "customize" to take me to the Cricut Design Space Canvas so I could edit the image and get it down to scale for a card. 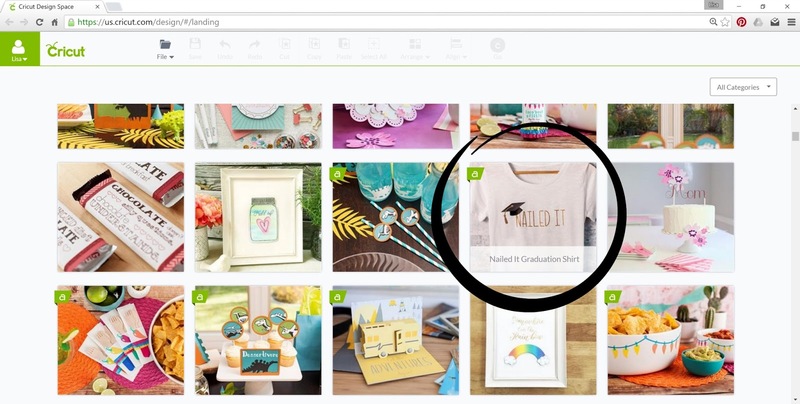 I almost always use pre-made cards (I buy those packs when they go on sale at Hobby Lobby like 5 at a time) so all I have to do is set my canvas to the size I want and choose either horizontal or vertical and I'm ready to scale down my elements! Since this was initially an iron on project on the landing page, that means all of the elements were default to be cut, so I didn't need to make any adjustments there. I made 14 of these cards (I'm a biiiiiig fan of making at least a dozen of whatever card I'm designing when I have the time with the Cricut! ), which is easily done by changing the number to 14 at the print screen. When it came time to cut the gold, I was sure to change the dial on the Explore to "custom" and selected the Cricut Glitter Vinyl. After cutting out all of the elements, I glued the cap together (the base is a flat black and the top of the cap is a textured black). Then, I peeled all of the tassels on and stuck those to the hats. The "Nailed It" needed a bit more precision, and that's where the transfer tape comes in! But because the glitter vinyl is made of slightly stronger stuff, the transfer tape that came with the vinyl pack (how cool is that?!) was extra strong transfer tape! PERFECT. 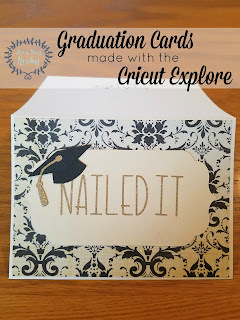 I used ivory colored cardstock and used the Cricut to cut a label shape for each card. Then, I used the strong transfer tape to put "Nailed It" on each piece of cardstock. Then, I put that cardstock on the black and white damask square. After that, I glued the graduation cap on the card to see how to best angle it so it was over the edges just a bit. 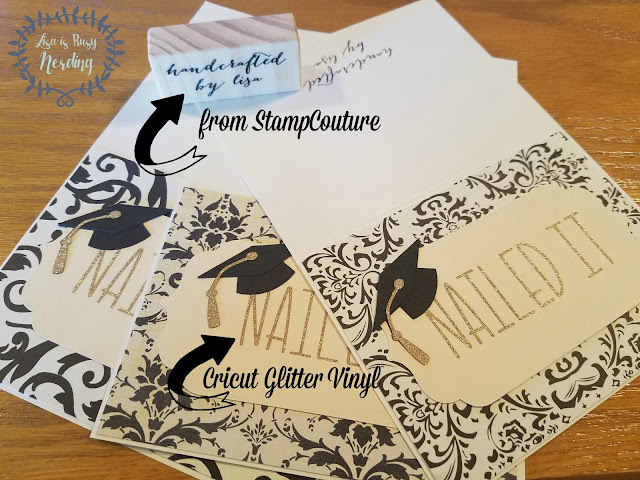 Side note: I'm obsessed with my "handcrafted by Lisa" stamp from StampCouture. It's a fun little something to add to my cards! 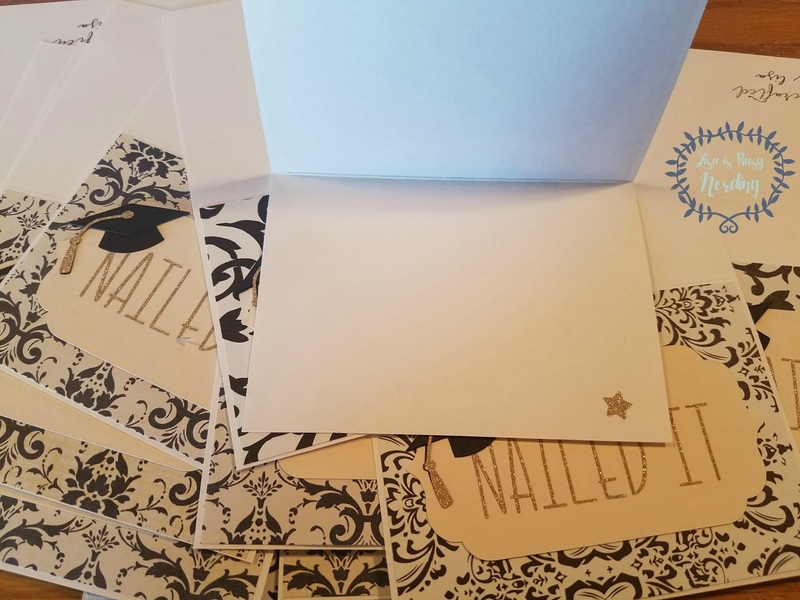 And, because one can never have enough glitter, I punched out a single star for the inside of each card for a little something special! Sometimes I'll cut a piece of paper or cardstock that I can put on the inside to write on, but with a black/white/ivory card - no color felt like it fit, you know? But a gold star always fits. ALWAYS. Superb cards! I like design a lot. 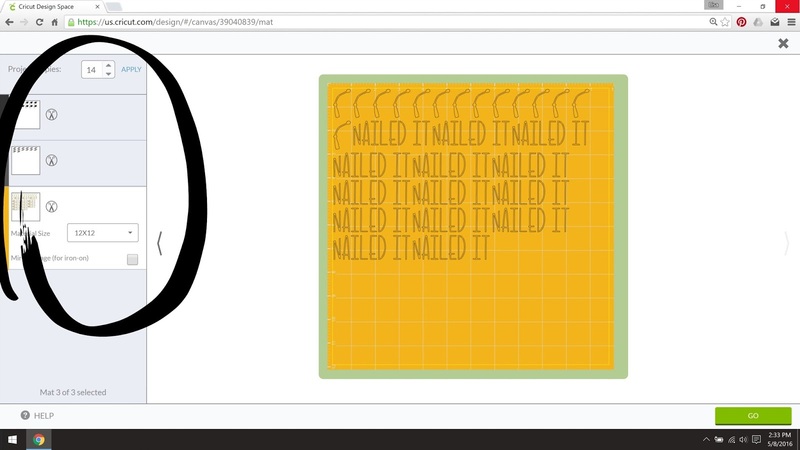 Thanks for complete tutorial on how you made cards. I will be trying to make my engagement party invitations on my own. You know I will have a spring themed party at garden party venues in NYC.